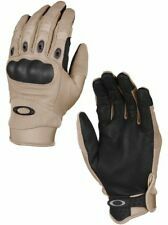 OAKLEY Factory Pilot Gloves - Khaki. USA Size XXL - UK Size XL Glove Size 10 to 11. 4 Way Stretch Material and Airprene Joint Panels for Superior Fit and Dexterity. 100% Genuine. Nonrestrictive Airprene Mid-Height Cuff with Secure Velcro Closure. Oakley Factory Pilot Gloves Size Large. 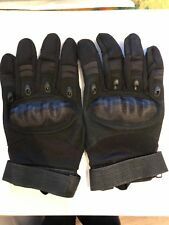 Oakley Factory Pilot Gloves Size Large. Never worn. Grab yourself a bargain. RRP £60. Dispatched with Royal Mail 2nd Class. Thanks for looking. Level peaks labelled. Oakley genuine issue tactical gloves. GENUINE BRITISH ARMY ISSUE SURPLUS. But I would say they would fit a guy with large hand. Size in British military would be a 10-12. Oakley Factory Pilot Gloves New Khaki (Small) British Army Issue. The gloves are new but will not come with any packaging, gloves only. More information can be found here: https://www.oakleysi.com/en-us/product/94025A?variant=887288727320 If you have any questions feel free to contact me. Size XXL ( treat as UK L - XL). These Assault Gloves have many useful features. Nonrestrictive Airprene mid-height cuff with secure Velcro closure. The SI Assault Gloves have many useful features. Surfacing on palms and fingers for a secure grip plus textured pull for easy donning. Multiple orders may take longer. Genuine Oakley Tan Pilot Tactical Gloves. Carbon Knuckle. SIZE XXL ABOUT HAND SIZE 10-11. TAN /BLACK - LEATHER AND SOFT CORDURA. Material : 35% Ziegenleder,15% Synthetisches Leder. Zustand: neu. OAKLEY SI Assault Gloves. Pilot Factory Gloves. Size: XXL fällt etwas kleiner aus ca. 13% Spandex, 10% Nylon,10% Neoprene, 5% Rubber. OAKLEY SI assault gloves. Pilot factory gloves. Size: XXL slightly smaller CA XL. English use gloves. 5% carbon, 3% Kevlar, 2% Lycra, 2% other. Material: 35% goat leather, 15% synthetic leather. 13% spandex, 10% nylon, 10% neoprene, 5% rubber. Oakley Factory Glove. Oakley Factory Pilot Logo. Model: Factory Glove. Performance fit of 3-D anatomical construction. Colour: Red Line. Size: Small. Stretch Spandura chassis for flexibility. finger zones for a sure, responsive grip. • Cuffless design with flexible articulated construction. • Breathable Airprene for comfort.